A couple months ago, the Los Angeles Chargers had the look of a team that would be headed to the playoffs when the regular season ended. But the Baltimore Ravens—not so much. Their defense was playing well but the run game was almost non-existent, and the passing game had become stagnant. So, the Ravens decided to make a change—and it worked. Joe Flacco went down with an injury forcing them to go with rookie Lamar Jackson and they started to win games. When Flacco was healthy enough to play they stuck with Jackson. Now, not only did they make the playoffs, but they won their division and are favored to win. The Ravens are proof that you don’t have to be good at everything in order to win games. You just have to be really, really good at whatever it is you do—which they are. They ran for 200+ yards in five of their last seven games. 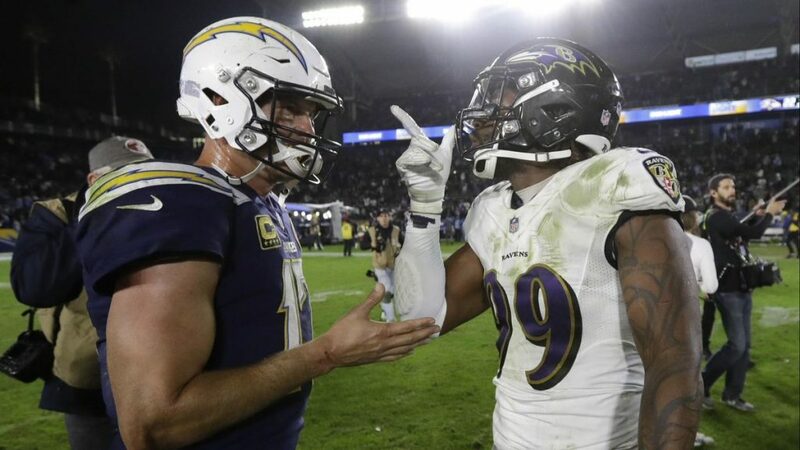 On the defensive side of the ball, while they only played a couple of good teams in the second half of the season, they did limit the high-powered Chargers to just ten points and 198 yards of total offense. If they need to pass, they may be in trouble. Jackson has only cracked 200 yards once (and it was against the Chargers). However, to be fair, he did do an excellent job of throwing the ball in that game. He wasn’t as good the following week against the Browns. But the Ravens ran for nearly 300 yards in that game. So, they didn’t need him to throw much. The Chargers were one of the better offenses in the NFL all season (sixth in scoring; 26.8 points/game). But against the Ravens, they couldn’t do anything right. The protection for Rivers was poor. The running lanes for Melvin Gordon were hard to come by. Rivers was certainly off his game and when he did complete a pass, the receiver was often tackled immediately. They basically played nothing at all like the talented offense that they are. But despite their failings, they were only down 6-3 at the half. That is because while the defense did bend, they didn’t break. They forced the Ravens to settle for field goals four times. They forced a turnover that set the offense up on a short field for its only touchdown. The only score they gave up came off a big play. Jackson didn’t have a long touchdown drive in the game. The Ravens are very good at what they do – defense and running the ball – which makes them hard to beat. But for the right team, it also makes them easy to beat. There is no doubt as to what the Ravens are going to try to do. They are going to run the ball with just enough passing attempts scattered in to keep defenses from keying on the run too much. The Chargers need to do like they did a couple weeks ago. They need to stop the run and force the Ravens to settle for field goals. But for that to work, they have to get the offense moving this time. If Baker Mayfield can throw for 376 yards and three touchdowns against the Ravens, surely Philip Rivers can with all the talent he has surrounding him. Look for the Chargers to put up much more of a fight this time and for Jackson not to throw the ball nearly as well as he did last time. The game will be close, but in the end, the Chargers will come out on top. If they don’t win straight up, they will against the spread (+2.5). As for the over/under (42)—the Chargers are going to score some points this time. Take the over.